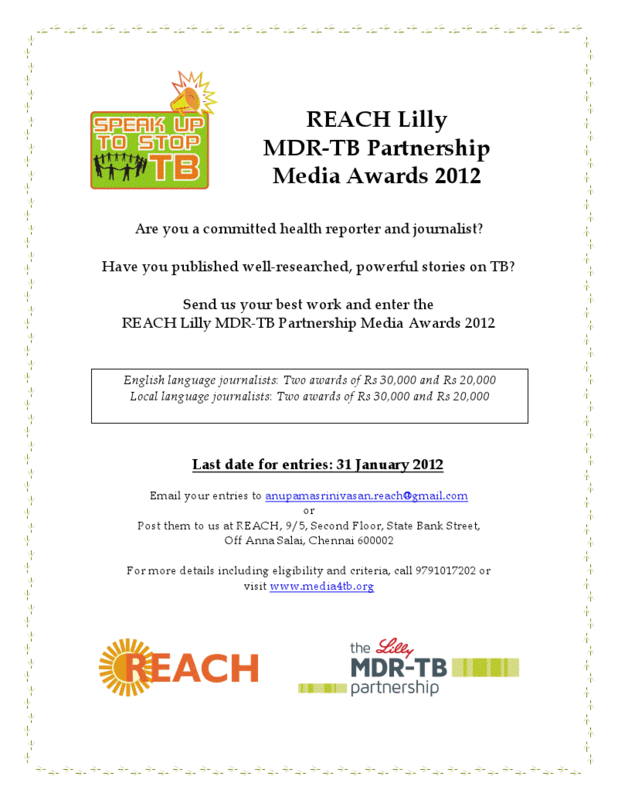 REACH is delighted to announce the third edition of the REACH Lilly MDR-TB Partnership Media Awards for Excellence in Reporting on TB. These awards recognise the best reporting on TB by Indian journalists, in English and all other languages. All stories must have been published between January 2011 and January 2012. I had a mail from an NGO about a week ago. It was from a lady who had an interesting programme going. She was very appreciative of JATB but wanted me to write about her programme or get a friend to write about it for the mainstream media. While I gladly offered to feature it on JATB, I did not give her any guarantees for getting space for the story in the mainstream media for obvious reasons. The lady replied very politely, thanking me for my offer, but equally politely declined my offer to feature her story on JATB. She had concerns about her target audience not being able to access the information through a blog. End of story? Not really, because it got me thinking. She had in some way blocked the flow of information by narrowing her options and restricting her choices. And this in a day and age when information can flow freely at a pace that we can set for ourselves. I would like to draw an analogy here between information and water. Both have a way and will of their own. You cannot restrict both. Ever heard of water getting blocked just because a big rock sat in its way? It will just find a way around the rock and continue to flow. So also information. New media, social media, new spaces for dissemination – these are not just words to be bandied around. They are real, they are powerful and used properly, they are powerful tools that can get us where the mainstream media probably cannot, not to take away from its value. Wouldn’t the lady and her programme been better served if she had chosen to let information flow any which way? My advice to her and others like her, is to unlearn some of the ways we have chosen to communicate. As a journalist friend of mine says, each of us knows how to communicate from the day we are born. Let’s keep all those skills alive, let’s use all the options available to us. Think about it. A Very Happy New Year! I’m not sending out cards this year! I’ve learnt use JATB in different ways!! The NGO community ( I will refrain from terming it civil society because that infers the rest of society is uncivil) wants to be friends with the media. And the media couldn’t care less. Reminds me of myself in school. There was this hugely popular girl everybody wanted to be friends with. I spent a considerable amount of time devising methods to ensure I would be on top of her friends list. I tried everything; gave her chocolates, lent her my notes with greater eagerness than was necessary and hung around her endlessly. Whenever she even deigned to smile at me, I imagined I had succeeded. Till the day I realised, with considerable shock that she did not even know I existed. I was just a face in the crowd! I was too young then to know that I would probably have been better off spending my time finding out her interests, finding out what made her tick if I really wanted to be her friend. Because my need was greater than hers and therefore I had to make all the effort. So where are we? That’s what JATB tried to find out. We got an NGO spokesperson and a media person to speak with each other with no holds barred. The outcome is interesting, revealing and might just give fresh insignts into how the NGO community and the media can understand each other better. Await the discussion. On JATB in the first fortnight of 2012. The recent decision by donors to cut contributions to The Global Fund is alarming. The war against TB has been extremely hard for all of us. If funding stalls at this stage, it can reverse the gains so far and translate into millions of lives lost. Please do not let this happen. It will be a human tragedy not fit for a civilized world. TB very real. The context calls for an uninterrupted and coordinated effort across sectors. 2 Civil society is currently giving one of the strongest pushes, in global history, to TB control, with support from partners like The Global Fund, and in coordination with the government. Without this support, the movement would die as there is no other funding mechanism in the country for the task at hand. Years of progress will be stalled, and indeed reversed, with the poor and the marginalised bearing the brunt of it. It will be a major setback to goals like ‘universal access’, to community motivation, and to the money already spent, just as real headway was being made. 3 Global Fund Round 9 TB funds to India started a landmark five-year civil society project in 2010 on ‘Advocacy, Communication and Social Mobilisation’, with an ambitious target of reaching some 750 million people in 374 districts across 23 states, including 174 million women, 199 million children and 250 million people in poor districts. Phase I, 2010-12, has shown encouraging results, with 247593 patients put on treatment in the second quarter in 2011. Phase 2, 2012-15, will now be critical. 4 Stability of funding is crucial to not stifle newly emerging grassroots voices that have now begun to mainstream patient and community needs in India. Restricting support at this stage will signal a broader retreat from partnerships in governance, push back rights-based health reforms, and halt the on-going process of community empowerment in TB care and control. The Global Fund has helped India customise its TB programme through social participation in public health, and made access to healthcare more democratic. We must not lose the opportunity to replicate this model. 5 India is at a point when the national momentum can have a global impact on the Millenium Development Goal of halving the rate of TB infections by 2015. While India is increasing its health spending in its next five-year plan, this remains below the World Health Organization standard. With economic slowdown and competing priorities, there are major challenges to consistent health spending by emerging nations like India. Donor funds can be oxygen in this time. The Executive Secretary of the WHO Stop TB Partnership recently said “Let us not squander the huge investment the world has made in the health of people living with HIV by losing them to TB, a curable illness.” What was said in the context of TB-HIV co-infection globally bears a great parallel to ‘the huge investment’ civil society has made in India. We cannot squander this investment away. The Global Fund is a crucial partner now in India’s fight against TB. Beyond the logic of reasons for why this fight must go on, and why it needs support, there are bigger questions too: of ethics, of commitment, of solidarity and, indeed, of human life itself. It is our appeal and request that these questions are not forgotten. South East Asia regional office, New Delhi, India.